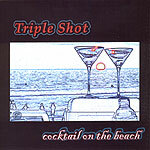 CD review: "Cocktail on the Beach"
Specializing in the kind of solid, no-frills, meat-on-the-bone blues and blues-rock that is a staple of juke joints and taverns across the United States, Triple Shot's new CD is a nice collection of shuffles, boogies and straight-ahead blues built around the guitar and songwriting of John E. Pappas. Triple Shot is, in fact, Pappas on guitar and Enrique Platas on drums, with Pappas doubling on bass for this recording. Platas is a solid, tight drummer  think Chris Layton of Stevie Ray Vaughan's band Double Trouble. He provides a loose, often loping beat for Pappas to play atop  creating just the right foundation Pappas needs to create his long, intricate solos on electric guitar. And Pappas' guitar is the star here  more than the songs, certainly more than his singing or even that of his guest vocalists. Imaginative, literate, drawing on influeces ranging from Vaughan and Albert King to Robin Trower and Kim Simmonds, Pappas' guitar playing is a joy to listen to. Not only one of the very best blues guitarists in San Diego, Pappas could hold his own in most settings that come to mind. In fact, the lasting impression from this album is that Pappas and Platas would be better off scrapping the vocals for now. Pappas is a passable singer at best; Joey Carrillo is no great shakes at singing, either. It's Pappas' guitar playing we want to hear.